More than a year ahead of scheduled elections in the unrecognized republic, three prominent candidates are already running for the de facto presidency. A screenshot of an RFE/RL broadcast of the 2017 sentencing of Samvel Babayan on arms smuggling charges. Babayan has now thrown his hat into the ring in next year's elections for the de facto leadership of Nagorno-Karabakh. Elections in Nagorno-Karabakh aren’t scheduled until 2020, but candidates are already lining up. Three prominent figures already have signaled their intention to run for the de facto presidency of Nagorno-Karabakh, the unrecognized Armenia-backed republic. Since the “Velvet Revolution” last year in Armenia, there has been a conspicuous cooling of ties between Yerevan and Stepanakert. Armenian Prime Minister Nikol Pashinyan has few ties to Karabakh, unlike his predecessor, Serzh Sargsyan, who was a Karabakh native and a close ally of the current de facto leader of Nagorno-Karabakh, Bako Sahakyan. Sahakyan himself announced in June that he won’t be running for another term, opening up the field for new contenders. One candidate, Arayik Harutyunyan, a former de facto prime minister and now senior adviser to Sahakyan, has been positioning himself as a backer of Pashinyan. In November, during a particularly testy series of exchanges between Pashinyan and senior officials in Stepanakert, Harutyunyan came out publicly in favor of the Armenian prime minister. “Pashinyan has always been caring about Artsakh over the last few months, supporting the efforts of the Artsakh authorities aimed at increasing the level of defense and economic development,” he said. Harutyunyan has not formally announced his candidacy, but a former de facto deputy prime minister, Artur Aghabekyan, has endorsed him. Aghabekyan wrote in a Facebook post that he is frequently being asked who the next president of Karabakh will be. “Having been deputy prime minister of Artsakh [the Armenian word for Nagorno-Karabakh] and working with Prime Minister Arayik Harutyunyan, knowing his vision and vision for Artsakh's future, I think that Arayik Harutyunyan should be the next president of the country and I now declare that there is no alternative to Arayik Harutyunyan,” he wrote. Harutyunyan also has been sparring with another potential candidate, a notorious veteran of the war with Azerbaijan, Samvel Babayan. Babayan said in a February 6 interview with RFE/RL that he is starting to collect signatures to get a place on the ballot. It’s not clear whether he will be eligible to run, because the law requires the president to have lived for the last 10 years in Nagorno-Karabakh. Babayan has spent most of the last ten years in Armenia and Russia, some part of that in prison on charges he claimed were politically motivated. 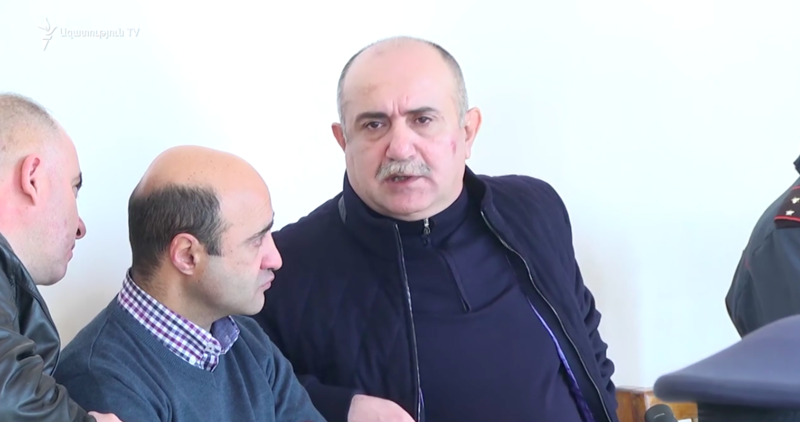 "I would suggest to our friend Samvel Babayan to live as a regular person in Artsakh for at least one year in the past 30 years,” said one former member of parliament, Vahan Badasyan, in response to Babayan’s candidacy. After Babayan’s most recent prison term, for weapons smuggling, he was given amnesty following’s Pashinyan rise to power and suggested that he could be a leader for Karabakh that had the favor of the new authorities in Yerevan. "There is no problem regarding my return to Karabakh,” he told journalists in June. “There is one state, Armenia, which has to decide for itself. The power has changed, they have to decide who they see there, what they do. If they see that I’m the one to be there, I have no problem." But in announcing his candidacy, he suggested that the current authorities may block him from running. “Yes, we will have signature collection starting in March, after which it will be clear whether the authorities are following the constitution or ignoring it,” said Babayan. Balasanyan has spoken in support of former Armenian (and Karabakh) president Robert Kocharyan, currently under prosecution in Yerevan; on January 28 Balasanyan called the charges against the former leader “ridiculous.” That prompted rumors that he would be a stalking horse for Kocharyan in the upcoming elections, which he was forced to deny even before announcing his candidacy. “If I do [run] I will not be anyone’s candidate except the people’s,” he said in a January 30 interview with news website tert.am. Ani Mejlumyan is a reporter based in Yerevan. Sign up for Eurasianet's free weekly newsletter.